On the last day of Eurostar I attended an impromptu workshop given by Michael Bolton in the test lab. During lunch I noticed that Michael had brought along a really interesting looking small bag that unmistakably clinked with small metal things inside. After lunch Michael asked the other persons around the table if someone wanted to join him in a session on exploratory testing. A woman whom I had met on an earlier evening called Baeza (I think it's spelled that way) said that she was game and came and sat next to Michael. At this point Michael leaned over to her and said quietly that there were probably going to be a lot of people gathering around watching them, and wondered if she would be ok with that (a very considerate thing to do from his part). He addressed the audience who had started to gather by now, and started describing what he was going to do. You see Michael has this thing that bugs him a lot (he has many things that bugs him, this one more than others). The thing in this case that bugs him is this very notion that some managers seems to carry around, that exploratory testing might be a fine thing to do. But they also think that it is this magical and strange process that goes on in the head of a tester, and in order to do it you have to have very senior and experienced testers, otherwise it wouldn't be of any use. Michael and James Bach is on the mission to show everyone that it is not something magical and that the skills that we use when we do testing is something we can identify, teach to others and make sure that testers get better at with new and improved skills. The reason that senior testers can seem to be better at exploratory testing is simply because they consciously or unconsciously uses the techniques all the time in their work when they do testing. Today he wanted to show us exactly what goes on in the head of a tester as we do testing, and specifically exploratory testing. And he promised that as Baeza were going to do testing, he was going to identify which skills she was using and explain them. He opened his bag and in a very dramatic and "Michael-esque" way poured out this pile consisting of different coins in all size, shapes and colors you could think of. 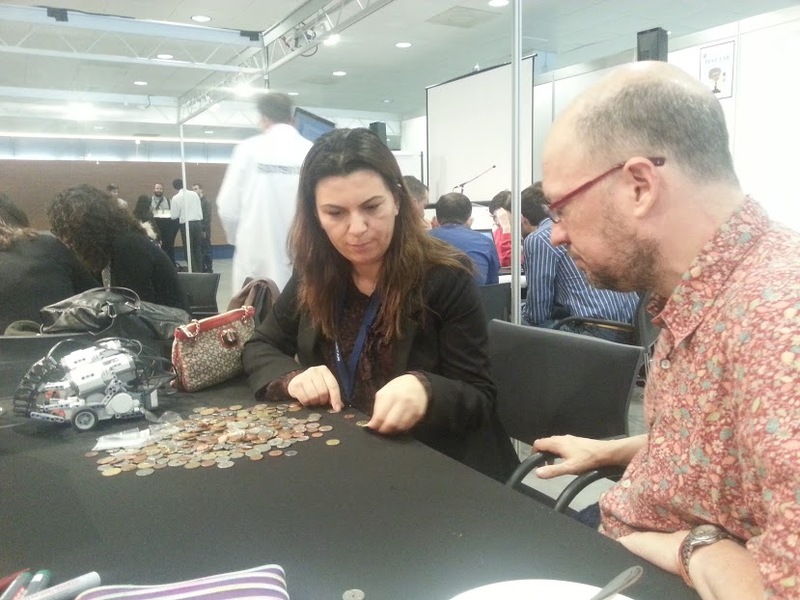 He next started to explain to Baeza (again the spelling...) and to the audience that for this exercise he was going to be a coin sorting machine, and that it was up to Baeza to identify the algorithm that he was using, he also warned her that the machine might have bugs as well, something she discovered and correctly identified later on. So Baeza started feeding coins to "the machine" and they stated to get sorted into piles. For those of you that have taken the RST class with Michael or James you probably recognize this exercise as a variation of the "RST Dice Game". So in an totally unsanctioned manner I have taken the liberty to call it the "RST Penny game". James and Michael loves games like these, and they love to challenge and to be challenged by other testers. Throughout the exercise Michael identified different things that Baeza performed and described them to the audience. And she was rapidly moving into testing in a more organized way. I hung around for ~40minutes of this brilliant presentation, but by the end of it I had to get going to the airport for my airplane, did anyone see how it ended? I absolutely agree with Michael and James that the skills that testers use in exploratory testing is something we can teach others, and also how to use them in a structured manner. It was a brilliant show and exercise that Michael gave us at Eurostar's last day. If you have never attended the RST class I wholeheartedly encourage you to take it and to take any chance you get in attending. Over the years since I took it in 2006 in Malmö/Sweden I have heard so many testers that have said how it profoundly affected their way of doing testing. P.S If anyone recognizes Baeza, I would love to know her full name. PresentationAs I have now mentioned for what feels like the gazillion time (sorry...), I attended Eurostar this year as a presenter.The session I was invited to speak about had the title:"